You can detect symptoms of allergy in your dog by observing them at home. About 10% of dogs have a food allergy. There are artificial substances in dog food that can cause allergy and there are natural foods that your dog may be genetically allergic to. Read on for a list of common foods that can cause food allergies in dogs. ⇒ Need to buy organic food for a dog with food allergies? Here’s a selection of organic dog food for you to buy online. Click Here. Just like humans, a dog can have allergies to foods. Sometimes, it can be one ingredient in food that’s made up of a mixture of other foods. But still that one item can cause your dog to become pretty miserable. Allergies in dogs can start when they’re puppies, so it’s critical that you pay attention to how your puppy behaves after you’ve fed him or her. One of the most common signs of food allergies in puppies is dry or itchy skin. Food allergies in dogs are best fixed while they are young. Your puppy may start to scratch so much that he or she develops raw spots on his skin. If your puppy has a thick coat of fur and they’re itching, you’ll have to spread the fur backward to be able to see the skin. Adult dogs can also have itchy skin and rashes, but they’re also prone to getting ear infections when they’re allergic to the foods that they eat. You may notice an odor coming from their ear and there may also be swelling. If you see these symptoms, remember they can be a sign of food allergies in dogs. Chronic ear infection is a good sign of food allergy because you’ll be able to recognize it easily. If the allergy persists or is severe, you’ll see a discharge coming from one or both ears. Senior dogs with food allergies can experience vomiting after eating as well as loose stools or diarrhea. It is often hard to recognize food allergies in dogs because there are so many different foods to consider as the cause. All dogs can experience a mix of any of the common symptoms associated with food allergies. Most puppy and adult dog foods contain items that can trigger these allergies. Look for things like fillers or dyes. One way that you can check to see if your dog is allergic to the food that he or she is eating is to do an elimination diet. Look at the ingredients list on whatever food you’ve been feeding your pet. To commence the elimination diet, buy other foods that don’t contain that item. For instance, if there’s dairy in the food that you’ve been feeding him, then buy one that’s dairy free. If you give him the dairy free dog food and his allergies clear up, then you know you’ve found his allergy trigger. ⇒ Placing your dog on an Elimination Diet? Here is a helpful link to a selection of dog food with limited ingredients for dogs with food allergies. This is an easy way to start your dog’s diet instead of trying to make your own dog food. Do the elimination diet with each food on whatever you’ve originally been giving him so that you can narrow it down to what’s causing his reaction. You’ll need to feed him the food without the suspected allergen for about five days to a week to see if there’s any change. 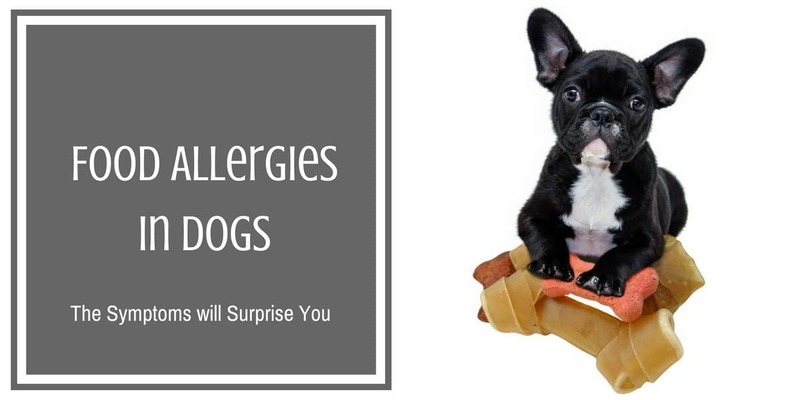 You need to be patient when you’re dealing with food allergies in dogs. Luckily there are plenty of specialist dog foods available such as grain-free or dairy-free. In the alternative, you can make your own. There are plenty of recipes available online. If you’re using regular dog food, then you can change brands and you can also look for food that’s organic. Organic dog food doesn’t contain the common allergy foods that regular dog food does, such as fillers. Organic dog food is a good place to start because then you get rid of the artificial ingredients altogether. If you feed your dog organic dog food and it still doesn’t help, then you may need to cook whole meats for your dog. If that doesn’t work, then you need to take your dog to the vet to get tested for allergies. The vet can do very thorough testing. If you eliminate food allergies in dogs as soon as you notice them, you’ll provide your dog with relief from the symptoms and help your dog to live a healthier and happier life. ☑ Worried about your dog eating too fast? Want to prevent your dog choking on food? See the best SLOW FEEDER DOG BOWLS here. Get one before you regret not acting sooner. This entry was posted in Dog Health on July 17, 2017 by Didi.